Powers/Abilities: Excaliber possesses heightened strength, stamina and reflexes for as long as he wields Morgan's copy of Excalibur. Invulnerable to Spider-Woman's bio-electric blasts, he can use the sword to knock a train locomotive off its tracks, to transform a policeman's horse into a steed worthy of a knight and to fire rays capable of stunning his foes. History: (Spider-Woman I#2) - Slappy Struthers was once a petty thief intent with stealing a sword believed to be King Arthur's Excalibur from the London Museum. The sword, however, was a copy of the true legendary sword created by the half-faerie sorceress Morgan Le Fay to use against her hated half-brother. Foiled by Spider-Woman from absconding with the sword, Morgan instead used it take control of Struthers, sending forth the spirit of her Knight to possess him. Calling himself Excaliber, Struthers was manipulated by Morgan against her old nemesis Magnus the Magician into retrieving her old book of spells in his possession. Spider-Woman meanwhile foiled Excaliber by knocking the sword from his possession and breaking Morgan's control on him. Turning Struthers over to SHIELD Agent Jerry Hunt, Spider-Woman became Morgan Le Fay's most hated nemesis. Comments: Created by Marv Wolfman and Carmine Infantino. This was Excaliber's only appearance. Morgan Le Fay, however, would be back many, many times and become one of my favorite Marvel villainesses. Actually, I'm reasonably confident that the Black Knight in Avengers III#77-81 is the same guy who possessed Slapper Struthers to become Excaliber. Struthers real first name is not revealed, but considering he's British, it could be Nigel or Cedric. Ha! Are those the choices in England these days? 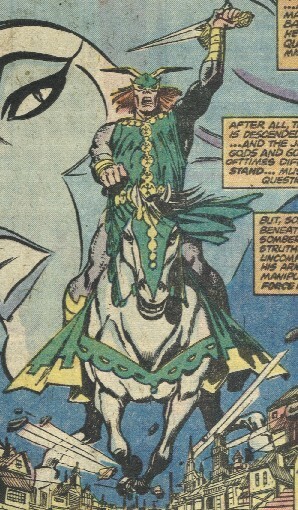 Excaliber's first name was revealed in Marvel Atlas#1. Caliburn, the sword of Adam Crown in the Knights of Pendragon, @ Knights of Pendragon II#1? Sally Struthers, blonde actress from the 1970's CBS tv series "All in the Family"